During a time when cold war paranoia and thinly veiled prejudices grip American society, an unlikely relationship develops between a mute cleaning lady and a mysterious creature being held at the secret government facility she works at. Guillermo Del Toro is a rarely gifted storyteller with an unashamed passion for the transformative magic of fantasy storytelling. His much acclaimed previous work on Cronos, Hellboy and Pan’s Labyrinth are masterclasses in the clever use of practical effects to bring a fascinating array of creatures and strange worlds to life on screen. In The Shape Of Water Del Toro uses all of that considerable technical skill and absurdly imaginative vision to craft a powerfully sincere romantic fantasy. Actor Doug Jones has long been Guillermo Del Toro’s secret weapon. The statuesque performer has collaborated with the acclaimed director countless times as a creature performer, proving himself to be uniquely capable of working with complex prosthetic makeup and visual effects wizardry. In this film Doug Jones gives one of his finest performances as a truly original leading man. His muted performance as the film’s muted amphibious ‘creature’ is the perfect counterpoint for Sally Hawkins equally mute leading lady. 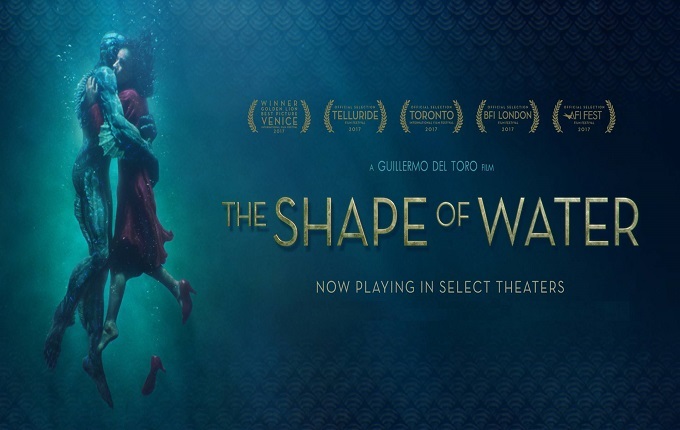 Del Toro’s exquisite visual style gives the film its beauty, but it is the expertly nuanced performances from a fantastic ensemble cast that gives the film its heart. Sally Hawkins is simply glorious as a mute leading lady who is by turns meek and inspiringly bold. Likewise Richard Jenkins, Octavia Spencer and a villainous Michael Shannon each bring considerable depth to supporting performances that help the film paint a complex picture of the struggle between unlikely love and ugly evil. Michael Shannon in particular deserves praise for delivering yet another performance that bristles with menacing intensity from his first moments on screen till the very last. An achingly romantic soundtrack helps provide the film with extra dimensions of nostalgic charm and sincere yearning. The film’s more uplifting and beautiful moments largely counterbalance its occasional flashes of ugly violence and menacing subtext. Like much of Del Toro’s unique work The Shape Of Water lurches between moments of indescribable beauty and ugly violent horror. While this is a very deliberate element of Del Toro’s dark fantasy it will prove at times jarring and potentially deeply unsettling for more squeamish audiences. At times when the film strays into more graphic body horror it risks alienating audiences lured by a marketing campaign mostly based around the film’s more softly romantic undertones. Del Toro’s trademark lush visual style and Alexandre Desplat’s emotionally warm soundtrack can’t entirely shield audiences from the film’s more unsettling moments. Guillermo Del Toro offers audiences a beautiful and visceral fable that echoes much of his acclaimed past efforts and pays tribute once again to the most iconic elements of fantasy storytelling. Accomplished visual effects and a stellar ensemble cast bring a truly unique if sometimes challenging love story to life. While not always an easy watch for squeamish audiences, overall The Shape Of Water is unforgettable movie magic. In the magical heart of the 1980s, a teenage geek named Eugene spends his nights dreaming of superhero adventures in far flung galaxies and his days turning those visions into comic books. Little suspecting that the heroes and villains he’s dreaming of are actually all real. When Hollywood decides to turn Eugene’s creations into a blockbuster movie it looks set to change the lives of Eugene and his loyal best friends. But things quickly get much more complicated when the world of Hollywood make believe starts colliding with real life adventures. Eugenius! is a truly joyous comic book homage that utterly embodies the most beloved elements of the genre. Undeniably original and fun throughout, the show strikes a nice balance between knowing comedy and genuine heart. Musically Eugenius! does a magnificent job of fully capturing the quirky magic of the 1980s, with original songs showcasing a wide array of crowd pleasing genres. The show has more toe taping rock anthems, seductively cheesy love songs, awkward raps and belting power ballads than you can shake an electric keytar at. Song title’s such as ‘Comic Book Kind of Love’ and ‘No Pants Dance’ give a flavour of the abundant playful charm on display. The biggest challenge for audiences is not singing along, particularly during catchy choruses and a memorable finale. Eugenius! has a wonderful ensemble cast that do full justice to the often demanding score while also delivering acting performances bursting with effortless enthusiasm. Liam Forde is a well-chosen fit for the reluctantly heroic Eugene, his boyish frame and powerful voice make for an endearingly awkward leading man. Likewise Dan Buckley is shamelessly entertaining as Feris, Eugene’s loyal ally who regularly proves to be a show stopping self-deluded delight. Perhaps the show’s most valuable asset though is the dazzling vocal power of Laura Baldwin, giving a literally note perfect performance as Eugene’s love lorn fellow geek Janey. Surrounding this central trio of west end superstars a versatile cast that breath hilarious life into Hollywood cliché’s and characters like Tough Man and Superhot Lady. The production does a fine job in particular of recycling its modest ensemble in a compact performance space. The show’s choreography deserves special praise as well for consistently packing blisteringly energetic displays into almost every scene. The dance performances add an extra dimension of spectacular spectacle to proceedings, crafted with a loving fusion of classic 80s moves and modern musical magic. 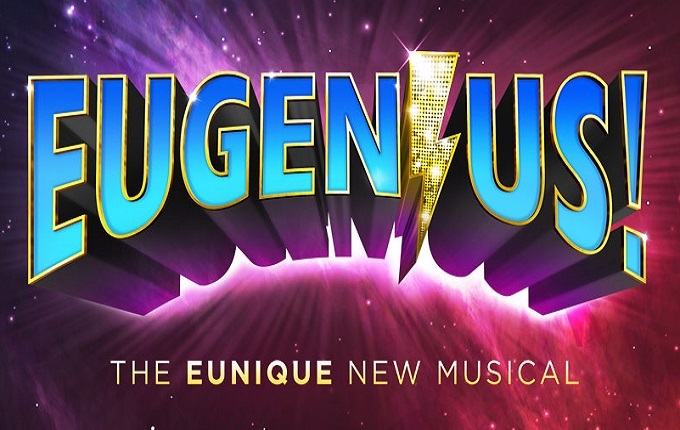 The overall look and feel of Eugenius! is a colourful mash up of classic comic book charm and 80s throwbacks. Smoke machines, knowingly cheesy special effects and spectacular spandex perfectly embody the true spirit of the production. Mark Hamill lending his instantly recognisable voice to a robot sidekick is also an extra special treat for fans. It’s hard to imagine a more perfect sign of just how loving well-crafted this production is than the fact that Luke Skywalker himself has given it such a vocal seal of approval. Audiences that are either too old or too young to have any affectionate memories of the 1980s and its timeless pop culture charms will obviously be a little less delighted by this shows relentless barrage of in jokes and playful references. Thankfully most of the show’s inspirations are iconic enough that even those with merely a passing knowledge should be able to laugh along quite easily. While the show’s silly slapstick sense of humour won’t appeal to more sombre cynics, thankfully there’s nothing more infectious than irrepressible joy. Eugenius! is a delightful explosion of musical madness fuelled by power ballads and pop culture. A brilliant ensemble cast, catchy original songs and camp clever comedy combines to make this show a truly delightful treat. Eugenius! is absolutely essential viewing for comic book fans, 80s obsessives and all musical theatre lovers. We urge you, book tickets for this show now, if you want a better life. 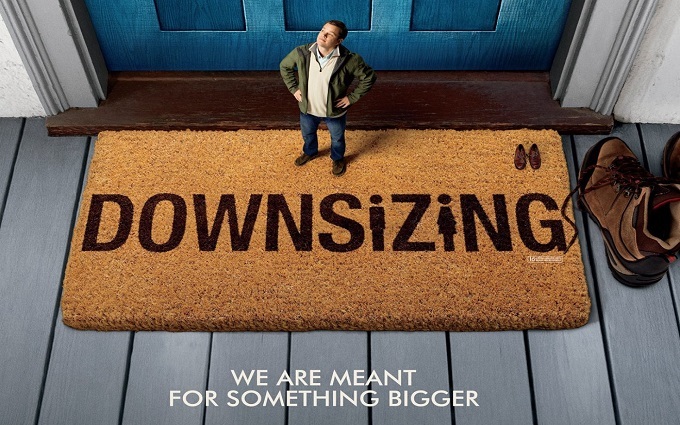 Downsizing is a film which combines thought provoking and intelligent themes with well executed special effects and an entirely convincing cast. The result is an entertaining and entirely original experience for audiences. The central questions that Downsizing explores are truly universal concerns about the environment, global economy and the ultimate future of humanity. These daunting and potentially depressing themes are however thankfully wrapped up within a series of uplifting personal journeys and the entertaining concept of miniaturization. Matt Damon is a much adored leading man and continues to transition skilfully from his former boyish charms and action heroics into more mature roles. His character in this film acts as a wonderful vehicle for audiences to discover the world of Downsizing. In particular, his kind hearted good nature and relentless optimism are a welcome contrast to the more cynical portrait of mankind which the film often presents. Alongside Matt Damon a host of familiar faces like Christoph Waltz, Udo Kier, Jason Sudeikis and Kristen Wiig help populate the newly tiny world. However the film’s secret weapon is a star making turn from actress Hong Chau. Playing an outspoken political refuge Chau is a consistent scene stealing revelation. Her performance is absolutely the heart of the movie, providing the film’s biggest laughs and most sincerely poignant moments. Pairing Chau’s joyously blunt Vietnamese prison survivor with Damon’s brow beaten and increasingly bemused American suburbanite, frequently yields excellent odd couple chemistry. This unlikely coupling helps carry the film in many unlikely but rewarding directions. One of the things that also enables Downsizing to tell a sincerely emotional and thoughtful story is the convincing special effects on show. Fine acting performances would not be capable of carrying audiences into the world of Downsizing if it didn’t look and feel so tangibly real. The film strikes a clever balance of making the reality of Downsizing equally wondrous and mundane. Director Alexander Payne has a specific style of melancholy storytelling. While some give him considerable credit for striking a consistently wistful balance between tragedy and bittersweet joy, others no doubt find the emotional tone of his films a little less readily satisfying. Downsizing takes a number of unexpected twists and those emotional and intellectual tangents force audiences to confront real life problems in a way they might not necessarily always welcome. Likewise audiences lured into the film by the promise of dazzling special effects will be less happy about the fact that though the film showcases well executed and clearly expensive visual effect work, the film isn’t ever trying to be just ‘an effects’ film. The goal of the film is always to make the effects less noticeable, not merely to showcase them in the most crowd-pleasing ways possible. People might go to Jurassic Park films just to see CGI dinosaurs, but you probably shouldn’t go to see Downsizing just to see tiny people. Downsizing is an intelligent and well-made piece of cinema that holds audience’s attention thanks to brilliant work from a well-chosen cast, polished special effects and thought provoking subject matter. Liam Neeson adds to his ever growing catalogue of action films that have clogged his career since the surprise hit of 2008’s Taken withThe Commuter. This time however it’s his wife and son as opposed to his wife and daughter who are in danger as they’re taken hostage offscreen in an attempt to force Neeson’s aged ex-cop Michael MacCauley to do ‘one little thing’ for the mysterious Joanna (Vera Farmiga) which will result in the death of a passenger. With a supporting cast which includes Patrick Wilson, Andy Nyman and the underused performances from Sam Neill and Jonathan Banks, The Commuter certainly has enough star power to reel you in. Most surprising of all is Florence Pugh who is completely unrecognisable from her previous role in Lady MacBeth, so much so that this writer didin’t even notice her, which is the highest of compliments. The story is easy enough to follow and plays out at times like a backwards modernised Murder On the Orient Express (though without any gorgeous moustaches) and no matter how ludicrous it gets the entertainment value is just the same as director Jaume Collet-Serra’s previous work (The Shallows) and works as a worthy addition to the now trilogy of collaborations with Neeson after 2011’s Unknown and 2014’s Non-Stop. Having already taken on the Harrison Ford trope of ‘where’s my wife and son!’ it’s a shame to see that Neeson doesn’t utter the phrase ‘get off my train’ at any point. Furthermore it’s a shame he doesn’t kick a train in the face which is what this writer was looking forward to. 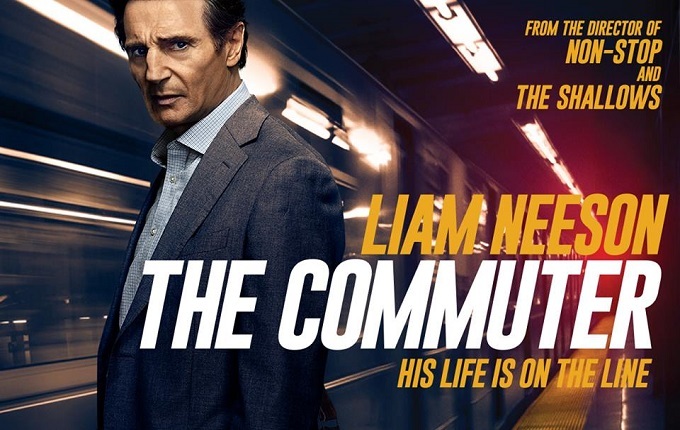 Suffice to say if you go into this looking for anything serious you’ll be deeply disappointed and may miss the action packed fun that The Commuter provides. If the homage to Spartacus doesn’t have you giggling away then you clearly aren’t the audience that the producers are trying to hook in. At its very essence, The Commuter is perfect Saturday night multiplex fodder that, if you’re close your logic can very easily become a highlight of the years cinema trips. It’s not necessarily Schindler’s List nor is it at the very top of Neeson’s recent action collection. But that doesn’t mean it can’t be a damn good 105 minutes to spend. I,Tonya documents the rise and fall of controversial Ice Skating superstar Tonya Harding based on astonishing real life events and conflicting personal accounts. The film charts her unlikely path to figure skating glory, her dysfunctional marriage and her ultimately violent rivalry with fellow USA skater Nancy Kerrigan. Margot Robbie delivers a truly Oscar worthy performance playing the infamously iconic Tonya Harding from awkward adolescent through to regretful middle aged cynicism. Aside from the obvious physical transformation and intensive ice skating training that Robbie had to endure to play the part, the emotional toll of playing the vulnerably unhinged young Olympian is self-evident. Robbie is able to morph effortlessly into the many different versions of Harding that the story demands, somehow managing to perfectly encapsulate and challenge audiences likely preconceptions at the same time. Around Robbie’s breathtakingly good central performance supporting turns from Sebastian Stan, Paul Walter Hauser and Allison Janney are scene stealing delights. Janney is on fine foul mouthed form as Harding’s belligerently mean spirited mother, Stan shines as Harding’s husband Jeff Gillooly, while Paul Walter Hauser is a comic joy as Gillooly’s ridiculously delusional best friend Shawn. The combined cast help paint a portrait of Harding’s life that is both hysterically entertaining and disturbed. Extensive world class skating sequences are a major technical challenge for the film. Thankfully though a combinations of Robbie’s dedication and well applied visual effects it’s possible to make Robbie a convincing skating superstar. It’s especially important that the film does succeed in doing this as arguably seeing Harding’s breath-taking skill and athletic bravery is an essential counterpoint to the infamous disaster of her life when off the ice. Overall I, Tonya is magnificent fun and skilfully pays with its occasional mockumentary style to illustrate the competing versions of the truth that continue to confuse one of the most bizarre and memorable moments in sporting history. Robbie’s award worthy central performance and a magnificently well-chosen soundtrack propel the movie with all the desperate grace and danger of someone performing a triple axel jump on ice…. More critical audiences might object on principal to the notion of in any way deliberately or accidentally glamorizing Tonya Harding’s behaviour and her apparent ‘crimes’. It’s a fine line to tread between capturing an accurate well balanced portrait of one of the most notorious sporting figures of all time and the risk of appearing either overly sympathetic or sensationalist. Thought the film does largely succeed in this respect, obviously those with preconceived notions about Harding and what she represents to professional athletics may find the existence of a big screen version less welcome.